Surveys help obtain feedback about a product, a brand name or a homepage from different participants. This information can be used to evaluate and draw conclusions from the results. For example to test a new product before it is launched – to determine whether the name, the packaging or the flavor are accepted by the customer – and whether there is a demand. It can also be used to monitor how comfortable users feel with a homepage, or with the selection of goods in a shop. Designing a questionnaire for a survey is quick and straightforward however a few minor items must be taken into consideration. To successfully operate an online shop you have to observe certain things. Among others, the shop and the content need to be updated at regulars intervals. This includes product descriptions as well as pictures of the products. However, many operators forget to categorize and tag their products. In just seven weeks and for the sixth year in succession, dmexco, the leading trade fair for digital marketing will be starting in Cologne. 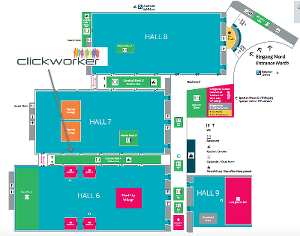 We the team at clickworker will also be represented with an exhibition stand, and look forward to welcoming you. For the first time ever, the dmexco will be giving away free tickets only for a short period of time. These tickets will be available from July 20 to August 17 – after that the tickets will cost between 100 and 400 euro. Pick up your ticket as soon as possible and schedule a meeting with us now! Yet it is awe-inspiring and gratifying when the power of the crowd is used to realize or promote non-profit CSR projects. There are already a number of very positive examples.